Are you looking for Godaddy alternatives because you’re not happy with them? You’re not the only one who suffer from excessive downtime, poor technical support, and cheap marketing tactics. The company used bold sexual advertising campaigns to promote its product. With a huge number of 13 million+ Godaddy’s customers, it clearly displays that the company is good at selling domains with a cheap initial price. But, it results terribly when the renewal charges go higher. I meant, incredibly high! Do you know there are great Godaddy alternatives out there who are much better than GoDaddy; they are dying to have you as their customer and they care about your business or website as much as you. They include an excellent range of offers, discounts, quality services, improved features and a good reputation in the hosting world. 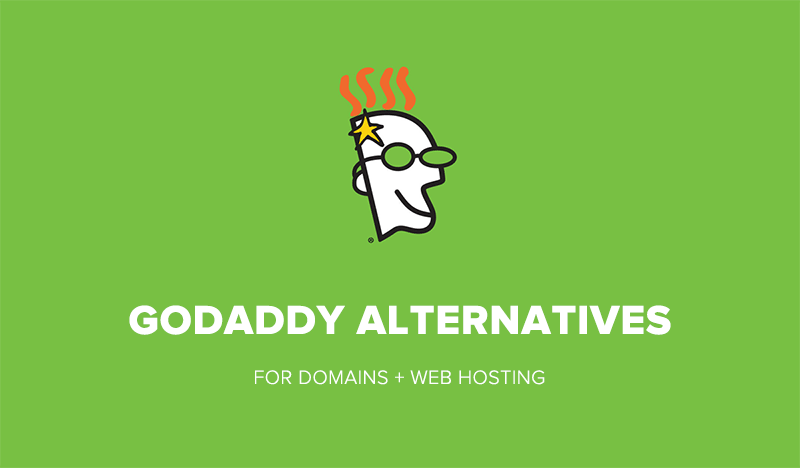 Here are the best Godaddy alternatives for domain and hosting. I’ve personally used these companies and will share my honest experience. Automated backups, daily and weekly. For domain registration, Namecheap is the best Godaddy alternative. For web hosting, InMotion and Bluehost are great options. I use InMotion currently and would definitely recommend you to signup with them. InMotion is a U.S based web hosting company founded in 2001. Their exclusive support quality makes them superior among other existing companies. 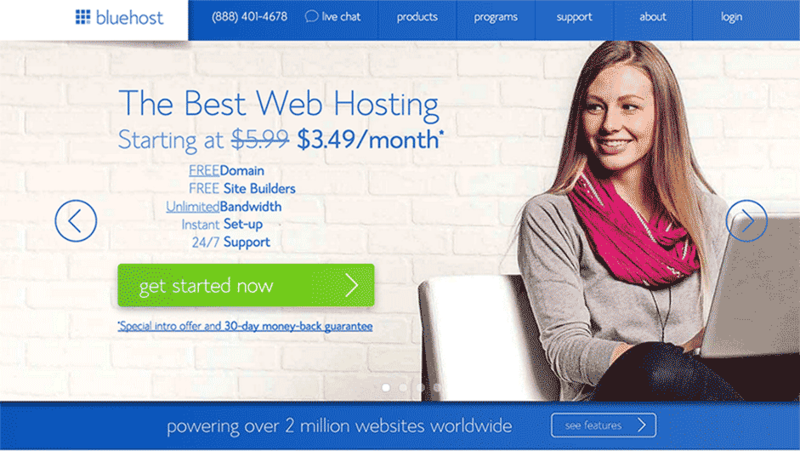 Out of all Godaddy alternatives companies, InMotion is a great alternative to Godaddy hosting. This is the web hosting I currently use to host this website and couldn’t be more than happy. The customer support is superb. They never took more than 2 minutes to respond to live chat and fix the issue. In fact, they have the best customer support as compared to other hosting companies listed here and that’s why I love them. 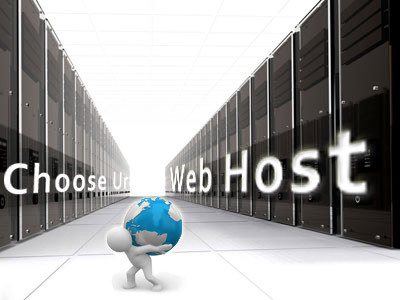 They have best plans to handle all your needs, from shared hosting to dedicated servers. The launch plan costs $2.95/mo and allows you to host 2 websites along with unlimited bandwidth and disk space. Power plan gives you freedom to host 50 websites for $6.29/mo and Pro plan allows you to host unlimited websites and domains for just $10.49/mo. Why I’m a big fan of InMotion hosting? Free domain credit – Some companies offer one free domain with hosting when you signup for an account. You’ll get one free domain credit for your account. If you signup for hosting and want to register a domain name later, simply contact their support and they’ll buy a domain for you – no extra cost. You’ll get one free domain credit for your account. 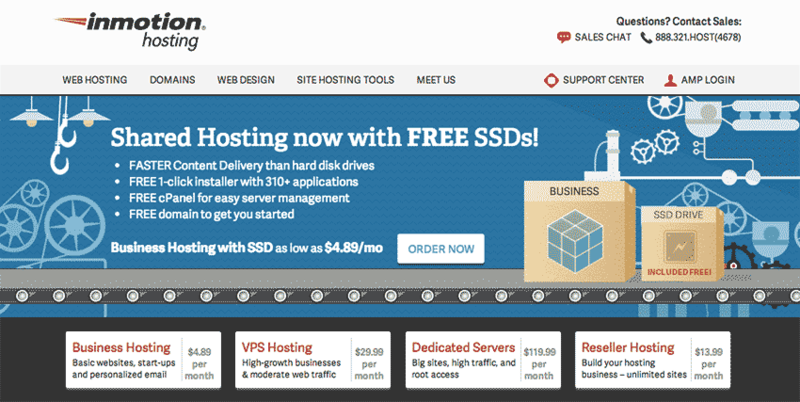 Fast SSD hosting – Your website will be loading very fast due to SSD technology. 90-day money back guarantee – Industry standard is 30 days. InMotion gives you 90 days money back guarantee so if you’re not happy with them (which isn’t what I think) you can ask for a full refund. Bluehost is definitely one of the top choices when it comes to web hosting and is one of the great Godaddy alternatives because of unbeatable pricing as compared to Godaddy. It comes out as the best option when you need to establish a WordPress blog. The company hosted more than 2 million websites that maintain a relationship between a vast range of customers. With latest technologies and excellent infrastructure Bluehost successfully sustained in the market of the top web hosting companies. 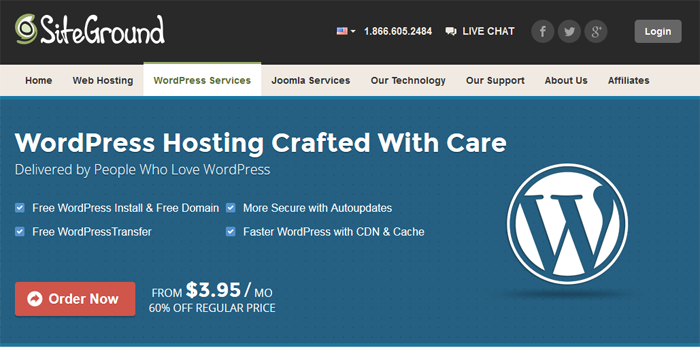 What I really like about Bluehost is their hosting is affordable and they are officially recommended by WordPress.org. You can get your website up for just $2.95/mo (using this link). The starter plan costs $2.95/month and allows you to host only one website. With Plus plan for $5.95/month you can host unlimited websites and for business pro plan ($13.95/mo) you can get 1 SSL, 1 dedicated IP and free marketing credits. Unlike Godaddy, the customer team is great, friendly and knowledgeable. They also have tutorials, guidance, WordPress installation videos and a number of articles to help you out in setting up your blog. Siteground is a popular hosting company and is also recommended by WordPress.org. They are well known for the fast web hosting solution. They use super cache technology to speed your WordPress website insanely. Siteground have professional and fast customer support. My experience with them is superb and that’s why I recommend them. I hosted this blog with them for one year and moved to InMotion recently. My blog was loading very fast due to their cache technology. The support team is awesome and takes no more than one minute to get connected with you. Siteground has established data centers in three continents. Considering the website speed and stability factor, it has built centers in the USA, Europe, and Asia. The company was founded by University friends in the year 2004. Gradually, it becomes one of the leading hosting providers in the world. It also claims to host 500,000 domains. It’s also one of the great godaddy alternatives because of free site migration and great customer support. SSD drives on all hosting plans. Dreamhost is another popular web hosting company started in 1997. The company is built on open-source technology to reach customer success. They offer domain registration, cloud services, and web hosting to more than 1.5 million website and blogs. The customer count has extended to 400,000 potential customers. The company has got Dream server for bloggers, webmasters, developer, designer or business. They not only provide web hosting but is a great option if you want to register a domain name. 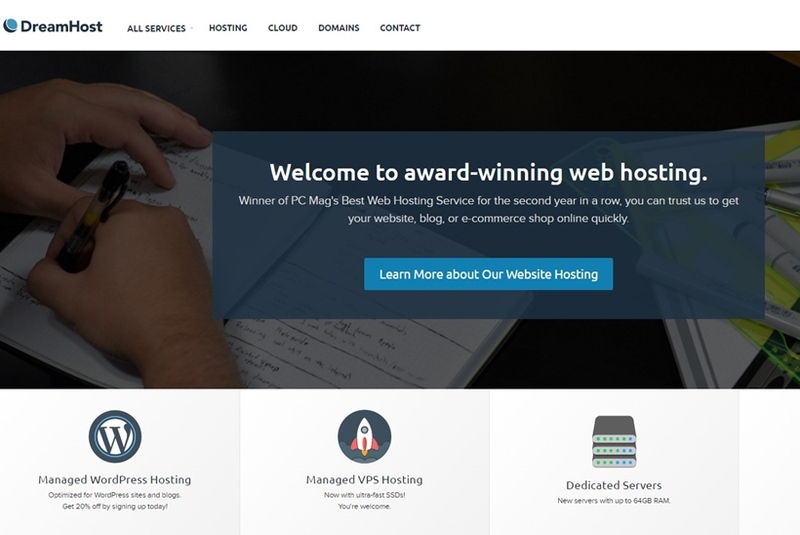 They’re one of the award winning web hosting companies out there. 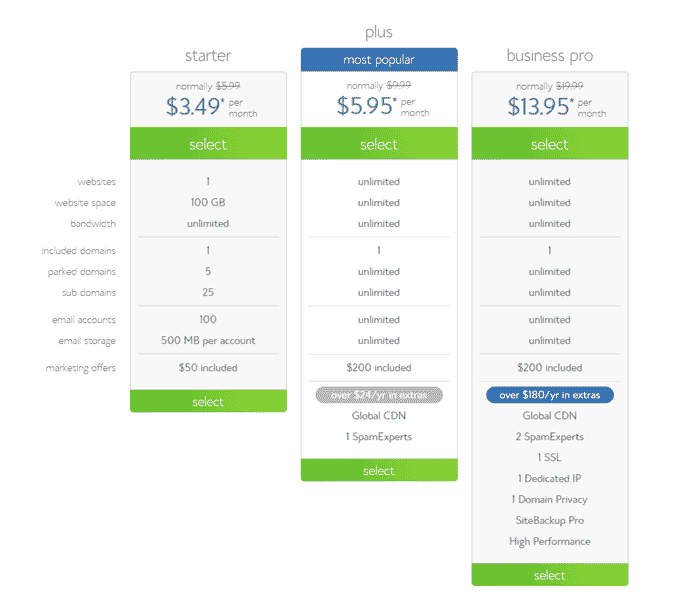 The pricing is bit high as compared to Godaddy but if we look over all then it’s a great Godaddy hosting alternative. With rocket-solid hosting plans and amazing features, the company has attracted a number of customers. Namecheap is one of the best Godaddy alternatives when it comes to the domain registration. It is even the top domain providers around the globe. They are hosting 5 million+ domain. Unlike Godaddy, Namecheap rates are impressive. Godaddy charges $11.99 for .com domain registration while domain at Namecheap cost $10.69 + FREE privacy (value at $2.88). I’ve been using Namecheap for more than 4 years and much happy with them. They provide 24/7 live chat support and is very responsive to email support as well. I never had to wait for more than 60 seconds to get connected to their live agent. The domain registration, transfer, and renewal prices are great as compared to Godaddy. Transfer of a .com domain costs $9.87, .net – $12.06, .org – $11.48, .co – $22.99, .me – $15.99 including ICANN fee. 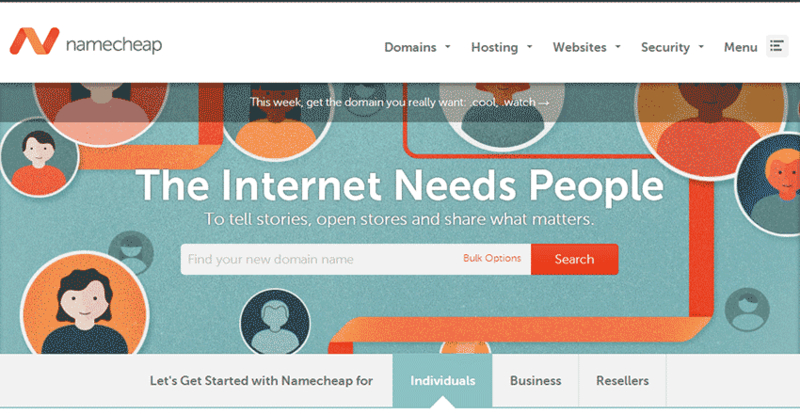 Here are some of the pros and features of Namecheap which is best Godaddy domain alternative. Excellent knowledgeable customer support team. All the above companies are considered as the best alternatives to Godaddy. Further in-depth reviews about the hosting services and domains will let you understand the sweeping features. Are you Godaddy customer? Share your experience with us in comments. I have 358 domains registered with namesile.com, and love them! : ) Cheapest prices and best management tools I’ve found, with no upsell nonsense like at godaddy. Privacy is included for free, and .COM transfers are $8.39 + 1 free year, then a max of $8.89/yr afterwards… although it goes lower if you have several domains. I host mostly with 1and1 now, and have been happy with them. I’ve been hosted by GoDaddy for years. For the most part it has been okay, Tech support was very good and I have some complicated stuff going on so it was needed. Recently I ran into the following problem. Way back when they lured me into paying for a bunch of years in advance for a better price. Now they are telling me that the server my site on is old and they are not keeping php updated etc which has resulted in problems updating my WordPress sites and plugins. They tell me that I need to migrate to one of their newer servers but that also means I have to setup a new contract with them and pay separately from the old one. In other words I would not get credit from what I paid in advance for old old server toward the new server contract, I would just have to eat any money paid in advance for the old server. Total BS. Looking for alternatives! I am using Godaddy From long time and completely satisfy with there service :) but still i would like to try other web hostings too :) thanks for kind recommendations. Godaddy is the worst host ever. In starting, I have purchased a hosting for one month from them and after wasting lots of money over their stupid call support, Shifted to Bluehost. They can’t even solve a simple problem and their support staff is useless. Till now, haven’t faced a single problem with Bluehost. I like it!! I am using namecheap and i would recommend every one to use it, because of its supports and hosting. every thing of name cheap is brilliant. You are correct 1 & 1 is the alternative of godaddy. But in 1 & 1 is the many time errors in hosting like resource limit exceed and more.So it is the not best overall. Indeed you giving awesome alternative.Thanks for sharing. I also don’t recommend Godaddy for any one. My blog also hosted in Godaddy. but most time my blog is down. Next month I hope to go Bluehost. I am use to Godaddy, never aware of others alternative, thanks for sharing. I will certainly apply it for my future use. Godaddy services is really become a pain in my mind. I am looking for some good alternatives and you have just sorted out my problem Mr. Ammar. Thanks for this post. Thank you so much for this eye opening post. I will definately checkout dreamhost as it seems good to me. I had tried Godaddy managed WordPress hosting few months ago and all I can say that their products and customer services are really horrible and very unprofessional. My sites get frequent downtime and they had no clue about it. Now I move to bluehost and it is really a good hosting provider and customer support is also good. Never had any problem so far. Great Stuff. I just read your interview from another blog. Awesome post also super achievement. :-) There are many other domain provider like 1and1 you forget to include. What is the best way to get traffic to a new blog? Thanks for appreciating. 1and1 is a good domain registrar but it has some bad reviews around the web. I do not recommend it personally. To get traffic to new blog check out this article. Thank you for make a list of world’s most reliable domain and hosting providers. I am using a domain from godaddy with a third party hosting. I was thinking to go for a self hosted blog. From the above list I have chosen BLUEHOST. Can I have some words from you in this case? Making Money From Niche Sites – Is It Still Possible? Should You Copy Content From Other Blogs Without Giving Credit ?